You could have a big jar like above with fun-size candy bars inside, each wrapped with some "sweet thoughts"--loving sentiments. I think I would give this to my husband as a gift for when he needed a little "pick me up". Your love could keep it in a deep desk drawer at work....or perhaps in their locker at school...or in a bedside table. Whichever they prefer. ...and when it gets low, be sure to give them free refills (of candy AND of new, sweet thoughts). This is great...the only trouble with it in my household would be that we had so many "sweet thoughts," we'd have to fill the jar every day! SITS sent me over...Happy Thursday! This is a fantastic idea! I'm leaving for a week long trip sans the hubs next week and I think I will make him one before I leave! Thanks! Love it... it's perfect. Plus, it gives us a chance to be creative. 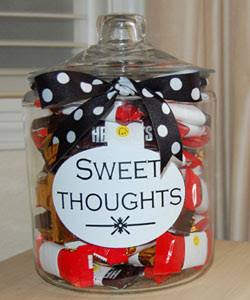 I think I might make a mini Sweet Thoughts jar to send to my husband on his upcoming deployment. I love this idea! My hubby has a birthday next week. I'll make him one that has 38 sweet thoughts for every year. Thanks for the great ideas! Love this idea!! Super Sweet!! Hi! Just poppin' in from SITS! I love your blog...and I totally want to make one of those jars..the only problem is that my hubby works all day and if I had that thing at home I would eat the entire thing (probably in an afternoon), which would be great for my mind, but not so lovely for my waistline :) Cute blog though, I am totally going to check back here for romantic ideas! What a cute idea. I've been trying to think of a cute (but not too expensive) gift for my hubby for our anniversary. I think I might use this one!! Thanks!! I love it! Ok, seriously.. I think I want to marry you. You have all the good ideas! What a GREAT Concept for a blog! I will be coming back often to check out your ideas. What an awesome idea! I've got a friend with a birthday coming up, this would be a great gift for her. I'd have to fill it with sugar-free since she's diabetic. Thanks for sharing! Have a fun SITS day! I was wondering do you have any ideas specific for a spouse's birthday? that's a super cute idea. Would work awesome with the kids too...for lunchboxes and whatnot. This was such a fun idea I couldn't wait to try my own little take on it! Thanks so much!